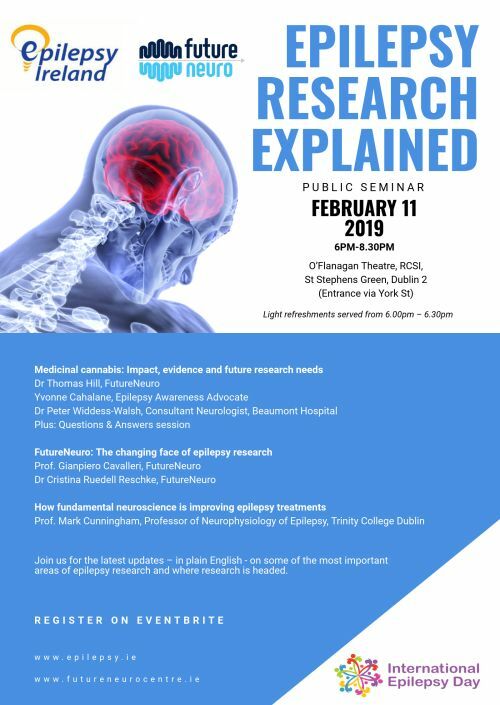 Epilepsy Ireland and FutureNeuro are pleased to announce that we will be co-hosting a Public Seminar to mark International Epilepsy Day on Monday the 11th of February.The seminar is for people with epilepsy, their families & carers and will highlight the latest developments in epilepsy research in Ireland and internationally. It takes place on Monday 11th of February from 6.00pm – 8.30pm in the O’Flanagan Theatre, RCSI, St Stephens Green, Dublin 2 (entrance via York St). Light refreshments will be served from 6.00pm – 6.30pm and the event begins at 6.30pm.